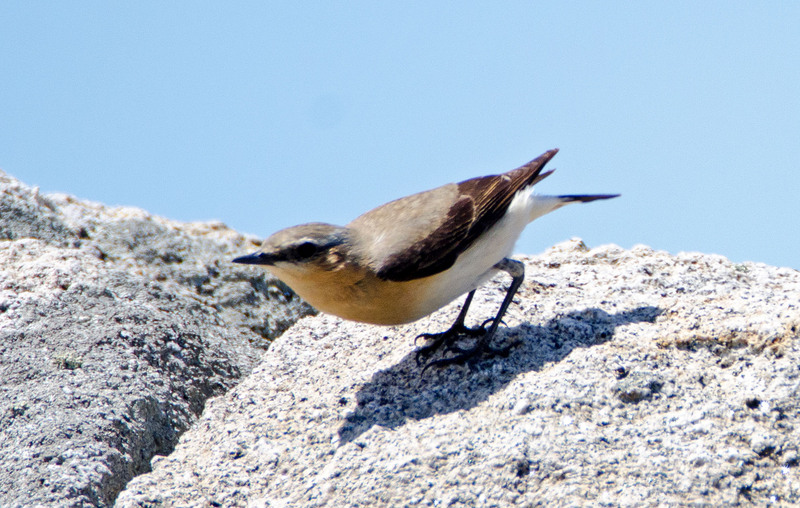 I crept up on this Wheatear, which was sitting on a rock at Cape Bares (Punta de Estaca de Bares) in Galicia, Spain. 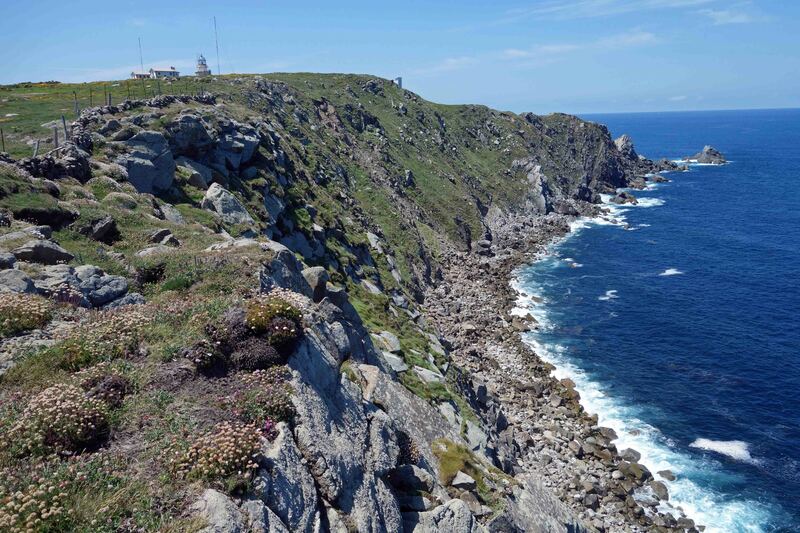 Punta de Estaca de Bares is the northernmost point of the Iberian Peninsula and sticks out into the Atlantic Ocean (Bay of Biscay). 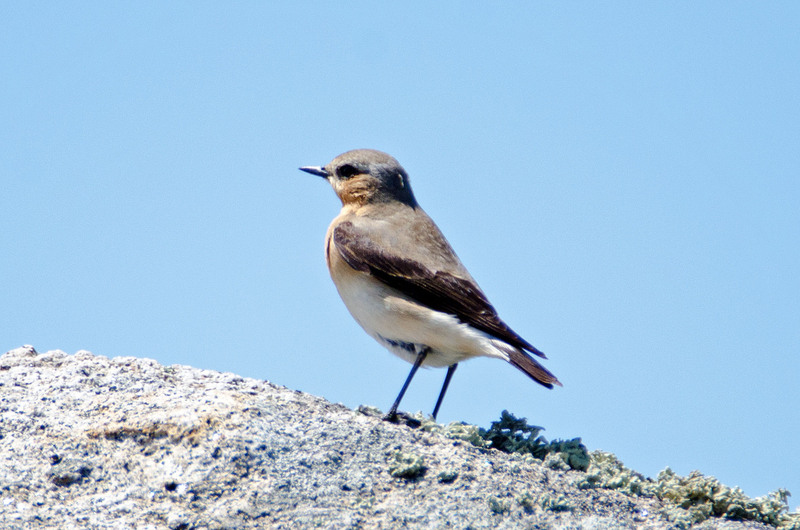 Northern Wheatears are said to be ‘rather local’ in Galicia (1), although I often see them in the spring and summer. Presumably they are on their way north, perhaps to breed in the British Isles, although some do apparently breed in coastal dunes in northern Spain (1). Coastline at the point (Punta de Estaca de Bares). As usual with birds, it is a bit confusing as there are four different subspecies of the Northern Wheatear. The so-called nominate race (Oenanthe oenanthe oenanthe) is mainly a passage migrant in Spain, seen throughout the country on its way north. Northern Wheatears overwinter in a broad band, south of the Sahara in Africa, and fly enormous distances to reach their breeding grounds in northern Europe, Asia and so on. One race, (Oenanthe oenanthe leucorha) flies all the way over to Greenland and Canada to breed, crossing thousands of miles of ocean to get there. The birds that fly up to the UK or Scandinavia, have shorter distances to fly across water, than their Canadian cousins! But it still an incredibly impressive journey to fly all the way from central Africa to say, Scotland! Interestingly, there are morphological differences between the races (or subspecies) which correlate with their life cycles; those birds who migrate over longer distances appear to have adapted longer, more slender and more pointed wings (2). In other words, the long distance migrants have evolved more aerodynamically efficient wings to enable them to fly fast and get to their breeding grounds as quickly as possible (3). They are starting to evolve into swifts! Another, Mediterranean race (Oenanthe oenanthe libanotica) is a common summer visitor to the north of Spain (1) but I don’t think it was this one I photographed, even though they are said to be quite similar! Where was this bird going then on 29th May this year? Was it going to fly north to Britain perhaps, like me, a few days later? If so it was a bit late. Or was it a local girl, looking for her mate?! 2. Förschler, Marc I., and Franz Bairlein. “Morphological shifts of the external flight apparatus across the range of a passerine (Northern Wheatear) with diverging migratory behaviour.” PLoS One 6.4 (2011): e18732. 3. Corman, Anna-Marie, Franz Bairlein, and Heiko Schmaljohann. “The nature of the migration route shapes physiological traits and aerodynamic properties in a migratory songbird.” Behavioral ecology and sociobiology 68.3 (2014): 391-402. Previous Previous post: Yellow and black larvae; red and black adults; what am I?